The Association of Young Arbitrators (“AYA”) was founded with the goal to inspire young practitioners to share their passion for arbitration with each other. Many perceive arbitration in Africa as closed to only those in senior positions, however AYA aims to assist the young practitioners by showcasing their talents and providing an avenue for mentorship, networking and education advancement. This year, the AYA has launched the African Arbitration Academy. 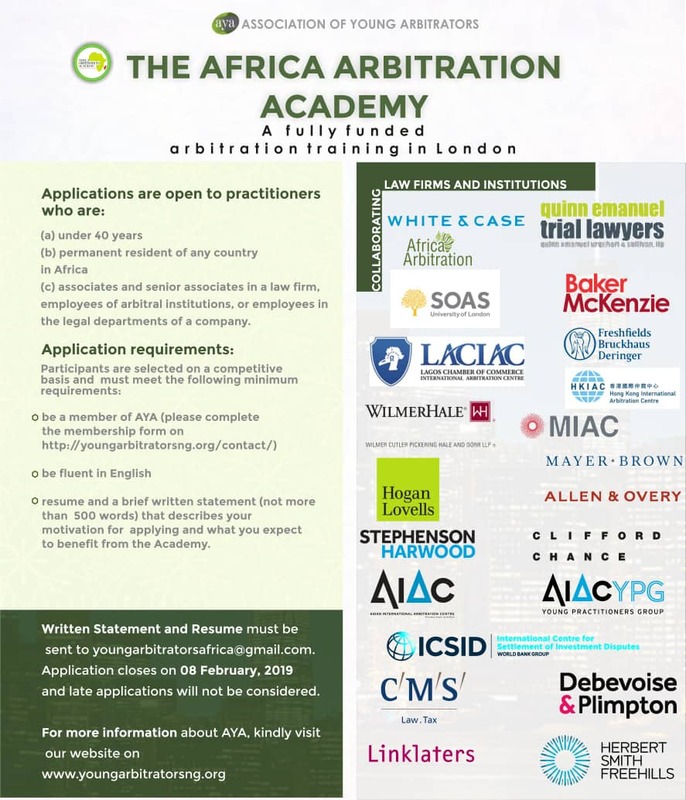 The overall objective of the Academy is to meet the need of the current rising demand for improved expertise and advocacy training for young arbitration practitioners in Africa. The Academy plans on introducing young practitioners to the current trends and developments in international commercial and investment treaty arbitration. The inaugural Academy will take place in London in June 2019 and be taught by international arbitration experts (academics and practitioners), including Mr. Vinayak Pradhan, Director (Acting) of the AIAC, heads of arbitration institutions, in-house counsel and judges. The Academy structure will include lectures, workshops and seminars, including mentoring workshops with renowned arbitration experts. The purpose of this format is to allow participants to not only expand their knowledge of international arbitration, but to also enrich them with better professional skills and a wider network. The Academy enjoys the support of about 20 city law firms in London and other international arbitration institutions.